GIST: How does technology divide us? Just look at the pervasive way in which technology is affecting our everyday lives. We may pride ourselves as users of technology. Yet, at the same time, we need to beware that technology can be a tool to divide us, by standing between one another to become a Technology as Validator? Maybe, in validating our facts, technology may be unwittingly invalidating the growth of our relationships. “It’s you (cellphone) and me against the world. Sometimes it feels like you (cellphone) and me against the world. As far as relationships are concerned, I think we speaking less to one another. We are talking less and texting more. We have reached that strange point in which we are most connected technologically, but more disconnected relationally. We have actually gone backwards in our humanness. One way that we have gone backwards is to let technology validate us instead of people validating each other. It begins with a blurring of lines between virtual and reality. Sherry Turkle, a Professor at MIT is a long-time observer and researcher of technological trends and their effects on human relationships notes the shift from one extreme to the other. Thirty years ago, people would be asking what they would use computers and technology for. Now, people would be asking the reverse. Is there anything they would not require computers and technology? Such a mood happens when the margin between the virtual and the reality is erased. Turkle shares about her interactions in Boston, throwing pizza parties so that individuals can share their virtual experiences with her. What she heard was startling. The people were so involved in their virtual worlds that there has been an “erosion of boundaries between the real and the virtual as they moved in and out of their lives on the screen.” Note that amid the “erosion of boundaries,” there is something else happening. The virtual life has overtaken the real world. People become more “themselves” only when they are validated by the gadgets they have. Let me give a few examples. Our daily interactions with one another have to be validated by a Google search, an iPhone app, or a website. Maybe it is the easy availability of speedy information that enables one to be precise with information. Maybe it is the fear of getting the wrong data. Or is it because one has lived so much in the virtual world that one reality is not reality unless the virtual world says so? My question. Why must we try to prove someone right or wrong in the middle of a conversation? As I ponder about the way people use technology, it is easy to start behaving as if the Internet has all the answers. Just the other day, I remember hearing someone’s visit to her doctor. When asked about what a particular medicine does, the doctor flips open his tablet, go to Wikipedia and started to read off the information word for word. Goodness me. Are not doctors supposed to know their stuff without having to read off the Internet? Honestly, if such are the modern doctors who rely more on the Internet instead of some personal knowledge and practical usage of medicines, we are in deep trouble. Yet, it is one thing to search for information. It is another thing altogether to know which information is important and relevant. Everyone knows how to use Google, but who can properly discern the right from the wrong. How we search for information is also dependent on how popular the information is. For example, nowadays, there is a clever guessing done by modern browsers. Type in the word “chicken” on the Google search engine and several options would have been guessed for you. Suppose my purpose is to do a school project that surveys the population of chickens, the different types of chickens, and what kinds of chickens appeal more to various people groups around the world, just by looking at the four suggestions above, I might have become distracted by food, forgetting about my school project about the worldwide distribution of chickens! This is exactly what is happening when we use search engines. Sometimes I feel that search engines have tried to be too smart, and as a result waylaid users. Is this then a case of unfortunate circumstances? Can I apologize to my teacher tomorrow when all I give is a recipe for chicken soup? Search engines, by becoming too smart, can indeed try to direct our attention away to the herd mentality. The suggestion that Google gives often presents the most popular choices at any one time. My problem is this. Just because a majority of the people are searching for chicken food does not mean I must be straitjacketed into doing the same. In the same light, just because Google says so at any one time, does not mean that I need Google to validate my thoughts and my opinions. Maybe, getting many “likes” or positive comments on our Facebook wall postings validate us. Some of my esteemed social media friends are amazingly popular. Everything they post, they get tonnes of comments, likes, and friend requests. Even the most mundane postings such as “Waiting for a bus” will generate some hilarious quips from friends. For every one such person, I also know of several others who will hardly generate any interest despite sharing deeply personal stuff. Maybe, some of us want the latest information in order for us to feel validated. Being in the know, the grapevine, or the distribution list of some important people, agency, or publisher can bring about some level of importance. As an active blogger, I am getting a lot more updates from various news agencies. From the latest publications to the most popular news, my email box is filled with all kinds of information coming through. Initially, it does make me feel kind of important. After a while, I get the feeling that I am being spammed more often than not. What about relationships? Imagine trying to keep a conversation going between friends without having to depend on technology to keep our conversation alive. Take for example, a dinner meeting. Before the meeting, we use technology to find our way to the restaurant. We search the shortest route or the most convenient transportation choices. We even check the weather report to see if we need to carry an umbrella. Once friends meet, technology continues to roll from the picture of food to the constant checking of Twitter and social media updates. After the dinner, we all go back to our technology gadgets on our way back home. Gone are those days where we can sit down for a 1 hour meal without having to respond to emails or social media updates. Gone are those days where we can sit on a bus and just chat offline with passengers and not simply work online with a distant person. Gone are those days when we can simply converse, interact, and be not so fixated at right/wrong answers to questions, but just communicate at a human level. I miss those days. Alas, we live in a time in which technology is so readily available that it is consuming all our available time and space. In trying to validate us, technology is doing something even more sinister. Dr Gary Small, a top UCLA researcher on Memory and Aging has this to say. We are unconsciously and unwittingly letting technology validate our self-worth, our relationships, and the way we live. In doing so, instead of us being users of technology, we are increasingly in danger of being used by technology. Let us beware of technology’s influence before it is too late. Do not let technology usurp the place of the Word of God. Psalm 119 is one of the most powerful reminders about how the Word of God is an anchor for life. The Word stands in direct contrast to the things of this world. It is the divine standard from which to measure life. It is the way of life for all who choose to obey and follow the Lord. The Bible call such a person who obeys the Word of God as “blessed.” They are divinely happy. They are willing to obey God and follow God’s ways. If there is any validation to be made, the Word of God will be primary source of validation. Everything else is secondary. In our technologically driven world, it is highly tempting for us to be validated by technology, just like the way email or websites validate us using our usernames and passwords. Maybe there is something else that ought to guide our thoughts away from our technological gadgets. It is plainly and simply this: Respect. Put away your cellphones when you meet or eat, or when you talk to your spouse or loved ones. 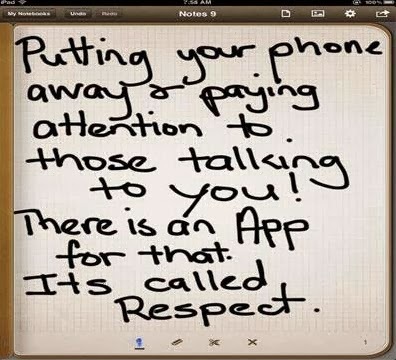 It may very well be the best "app" relationally. Pray that we be vigilant. Pray that we learn to float well amid a sea of data and information. Pray that we learn to dwell in the ark of God’s Word, to help us navigate and float on the flood of technological waves. Let us not be drowned and to unwittingly let technology validate our worth or our relationships. It is the Word of God that is the ultimate Validator, not technology.